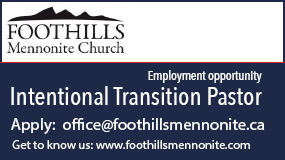 Emmanuel Mennonite Church, Abbotsford, B.C., is an intentional multicultural congregation. 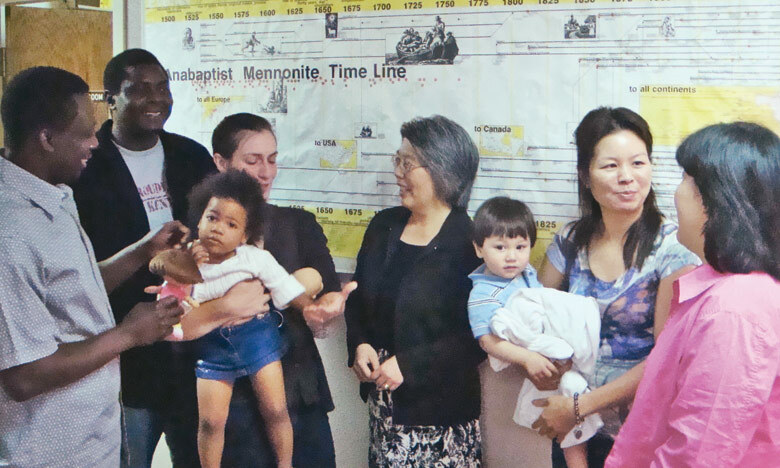 Pictured from left to right: John Cheny, Shigali Dembede, Alayne Cheny holding Naomi Cheny, pastor April Yamasaki, Janice Redekop holding Callahan Redekop, and Masako Moriyama. 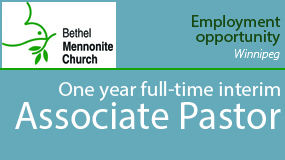 In 1981, the newly formed Emmanuel Mennonite Church drew on Jesus’ words in Matthew 28:19 to express its purpose as a congregation: “To make disciples of all nations.” At the time, the intention was simply to begin an English-speaking church, but, in the years since, it seems to me that those words have proven to be more prophetic than anyone might have realized at the time. In almost three decades, Emmanuel’s original membership has grown to more than 270, as the predominantly Russian Mennonite group has been joined by people from “all nations,” including Germany, Holland, Vietnam, China, Japan, El Salvador, Kenya and Iran. Emmanuel might not be officially “multicultural,” according to the standard definition of having a minority of at least 20 percent, but there are enough visible minorities that visitors often remark on it. At Easter, the traditional greeting, “Christ is risen!” was given in a number of different languages. At our Peace Vespers last November, we deliberately included prayers in English, German, Portuguese, Farsi, Arabic, Japanese, Swahili and Halq’eméylem. In a recent sermon, I noted that “community is the work of God in our lives. It’s not something that we can accomplish on our own. It’s God who transforms us.” So none of us can take credit for the growth and change in the church over the years. Still, the church took the risk, and so did I. And it’s that same kind of risk-taking and openness to change that is necessary if we are to become more multicultural and accept the challenge of opening the doors of the church and the doors of our hearts to others. • Empathy: Years ago, when we were both in our 30s, a friend visited a church where she was the only “white” person. “It was the first time I felt like a minority,” she said to me. How strange, I thought, that it took her that many years to feel that kind of difference! 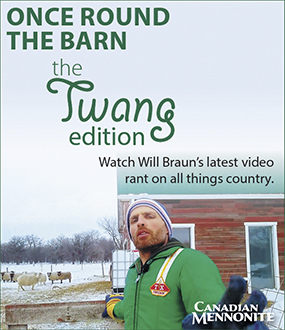 I empathize with those who are minorities in the church, who are not sure that they can—or even want to—“become Mennonite,” or who feel frustrated as permanent outsiders to the in-group who all seem to be related. I also empathize with those who find change difficult, who may even feel that they are losing “their” church. Both need to hear that together we can become more than we are, that we can become more and more the people that God is calling us to be. • Being deliberate: It takes effort to talk to the stranger in the church foyer instead of focusing only on those we already know and love. It takes time to get to know and include the gifts of others—not in a token way, but in a real way that makes a difference. In gatherings for prayer, I let people know that they can pray in the language they prefer. In worship, we sometimes sing songs in a language other than English, or encourage people to sing in the language they prefer. As I write this, though, I realize how little we actually do these things and I pray for more deliberate action. • Vision: To be—or become—a multicultural church, we need a vision for the church that is bigger than those who are already part of the church, a vision that moves us beyond ourselves and our own circles. In that way, the original founders of Emmanuel certainly got it right: We need to make disciples of all nations. We still have a lot to learn, and often stumble on the way. But by God’s grace, that vision is still before us. 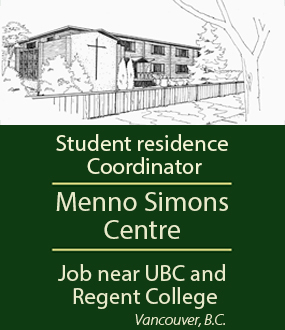 April Yamasaki is pastor of Emmanuel Mennonite Church, Abbotsford, B.C.